We all have questions when it comes to planning a wedding, especially when its for destination weddings in Key West FL! We’re here to help answer most (if not all!) of your questions so your planning process is a breeze. Don’t see an answer to one of your questions? Submit an Request For More Information or contact us at (305) 292-2121. We look forward to working with you on your Key West wedding! What is the maximum number of guests allowed on the grounds? Maximum number of guests is dependent on the event and style. As a general rule, we recommend up to 50 guests for a formal seated dinner event. For a cocktail party or an informal gathering, we recommend a maximum of 75 guests. For a seated ceremony, we recommend up to 60 guests. If you are concerned about available space, please ask us or your Key West wedding coordinator. What package is best for us? Because no two Key West weddings are the same, please consult with your wedding planner or the Manor’s Venue Manager to find the best combination of services for your needs. What package is best for us if we want all of our guests to stay at OTM but will be holding our events elsewhere? An Old Town Manor Buy-Out will be perfect! Read more about our Key West wedding packages. Will we be able to use the grounds during our stay if we do not book any events? The common areas on the property are for you to use as you would at any other hotel. If you’d like to “hang out” and have a few drinks with your guests, you may do this without consulting us. If you decide to have a “planned” event where you are providing alcohol or food to your guests, this must be booked through the Manor. To hold my event on the grounds, am I required to book all of the rooms? Since many of our rooms are directly adjacent to the garden venue, booking a minimum number of rooms for a 3-night stay will be required to host your events. Weekends in April, May and Columbus Day Weekend require a property "Buy-Out." For all other times, you are not required to book all the rooms. However, there are factors that determine the minimum number of rooms required including, the date, the size of your group, and the events you wish to host. Please inquire for availability and pricing. Can our guests pay for their own rooms? Yes! You, as the Host, are ultimately responsible for the entire package, however, you may allow your guests to contribute toward the total by booking their own rooms with their credit cards. We will provide you with a “room manifest” spreadsheet to help you with room assignments. After you have returned to us a completed manifest, your guests can call us with questions and to make payment for their rooms. At the 30 day mark, the Host will be responsible for any balances left unpaid. Can we have our ceremony and reception both at the Manor without having to move anything? Depending on the size and style of your event, it is possible. 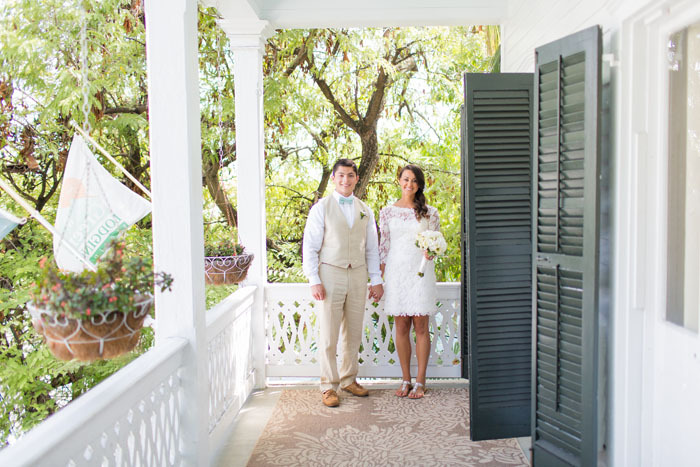 We always encourage couples to offer an alternative venue for their Key West wedding ceremony so their guests have a chance to see another part of our island. A popular choice is Fort Zachary Taylor Park. Please consult with us if you plan to hold both events on our grounds. Do we need wedding/event insurance? If holding a reception onsite, OTM requires proof of Event/Wedding Insurance from ProtectMyWedding.com or any other reputable event insurance company. Host must elect cancellation coverage to cover the Package and at least $1,000,000 in liability coverage with $250,000 in property damage. The reasons to secure insurance includes cancellations due to weather, medical, bankrupt vendors, Call of Duty, unemployment, accidents, damaged gifts and wedding attire. Make sure to have enough coverage for 100% of your wedding expenses including travel, room stays, caterer, florists, officiants, musicians, property damage, etc. Do you require that we hire a wedding planner? Although we strongly encourage all couples to hire a wedding planner for their destination wedding in Key West, we do not require it. However, if you are holding a reception on-site and you decide not to hire a local wedding planner, an additional charge will be added to the grounds fee. If you choose to hire an “out of town” planner, this fee will be waived if he/she visits the Manor more than 3 months in advance and becomes well versed on our policies and procedures. We will offer a discount to your Grounds Rate when booking a local planner’s "Full Service Planning" package for your event weekend. This discount does not apply when hiring an out-of-town planner. Does OTM’s Venue Manager do the same thing as a Wedding Coordinator? What do you recommend for rain back-up? Using tents as a back-up is the easiest solution but not fool-proof. Our gardens are not a uniform shape so multiple tents are required and only a limited space will be covered. If inclement weather is a concern, we suggest choosing a caterer with indoor space. Another option is to look into alternative indoor venues on the island. Please consult with your Planner for these options. When do we receive the vendor recommendations list? Our vendor recommendations list will be sent out upon booking, along with other helpful documents to help you with your planning process. Our proprietary list is based on ours and our past couples' experiences with local vendors. View our Key West Wedding reviews here for more information about what other couples have done. Do we have to use the vendors on your recommendations list? We ask that you stick to our list as much as possible. If you would like to consider someone not on the list, please consult us before hiring them. They may not be on our list for a reason. We do not receive referral bonuses from our preferred vendors, so our opinions are for your benefit. Are tables and chairs included with my wedding package? What size linens do I need? Do you offer linen rentals for your tables? If you are using OTM’s tables, we can assist with linen rental. We have a catalog with both basic and specialty linen to choose from. We do not have inventory on site. Rental rate will include set-up, break-down and shipping. If you are renting tables from your caterer or event rental specialists, please consult with that vendor about linen. What size tables should we order if we want a more traditional and uniform look? For 50 guests, we recommend renting 8 x 48” round tables along with 1 of our bistro tables as a Sweetheart table. You could also rent 6 x 60” round tables along with 1 of our bistro tables as a Sweetheart table. Ask us for a few examples of past wedding set-ups. The furniture you choose should also depend on the style of Key West reception you host. You must use electric candles when renting decor from OTM. Wax candles may only be used with your own vases or votives that prevent drippings from landing on the table, bar, ground, etc. Your votive or vase must surround the candle and be taller than the lit candle. Spilled wax will incur an additional cleaning fee. Can we hang decorations on the cafe lights? We allow paper lanterns to be hung on the cafe lights. If you wish to hang anything else, please ask as many items may be too heavy. If we buy or rent paper lanterns, how many do we need? There are 7 strands of lights. We recommend 2-3 large lanterns per strand. The lanterns that do not have an LED light in them are best. We have lanterns in a variety of colors in stock for rent. Please check on availability prior to your event. Is there room for a band? This will depend on the size and style of your event. Please consult with us should you choose a band for entertainment. All live music and DJ’s need to end by 11pm. Guests are allowed to stay on property later than 11pm to relax and mingle. However, most groups enjoy Duval Street after their event while the bartender and vendors break-down. Old Town Manor is a pet friendly property and can accommodate your furry family members. Advance notice is required and a one time fee of $50 for the first pet is applied to the reservation. Each additional pet is $25. There are no size restrictions, however a maximum of 3 dogs in each guest room is enforced. An LL Bean dog bed may be available upon request. All pets must be leashed, housebroken, people-friendly, non-aggressive, and quiet. Dogs must be crated when left alone in the room. A large dog crate is available upon request for a one-time fee of $10. Excessive damages due to non-housebroken behavior will be charged to the credit card on file. We reserve the right to refuse service to guests with a disruptive dog with no refund on outstanding nights. Do we have access to a kitchen? Guests do not have access to our kitchen, however, we will provide a full size refrigerator available to store drinks, ice, snacks, anything! Access to it is limited to a single designated person in the wedding party or group. This person will be given a key and is ultimately responsible for them. This amenity is only available when buying-out the Old Town Manor. Smoking is never allowed indoors but allowed in common areas only when the entire property is booked as a "Buy-out" and all rooms are occupied by wedding guests. OTM remains a smoke free facility if you are not booking a room "Buy-Out." Does Old Town Manor allow children? The Old Town Manor does not normally allow children under the age of 16 to stay with us. However, if you are booking the entire property, you are welcome to include children for the days booked in your agreement. Children are welcome to attend events at Old Town Manor. All children must be supervised by an adult. Is there parking for my guests? The Old Town Manor offers limited parking for guests. They are offered on a first-come, first-serve basis. Parking rates are $20-$25 per night. Vendors are expected to park on the street. Are there any “hidden” fees or charges? 7.5% tax and 20% service fee is added to all Grounds Rates as well as bar packages, decor and equipment rental, etc. Additional fee for using out-of-town wedding planners or not hiring one at all. To avoid this fee, choose one from our recommended list for "Full Service Planning" or "Day of Coordination." 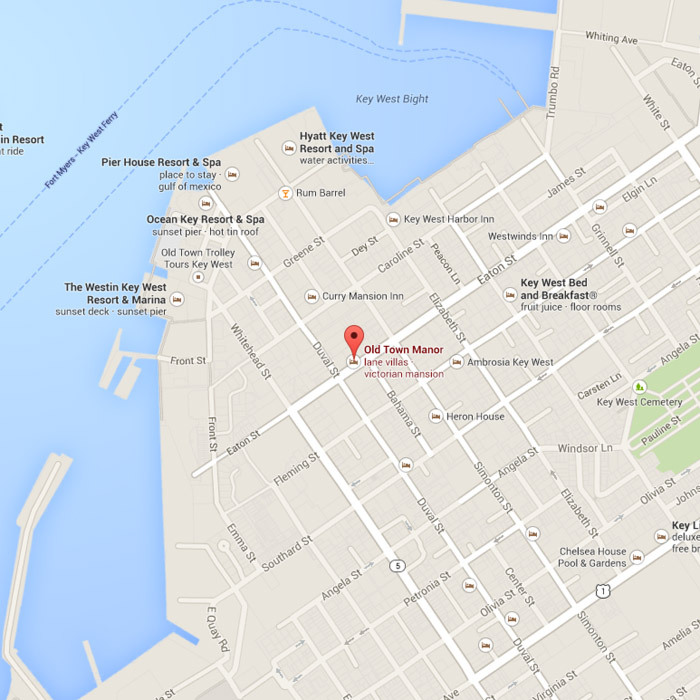 How do I obtain my marriage license in Key West? If neither of you are a Florida Resident and wish to get licensed in Key West, you need to obtain the proper marriage license prior to your ceremony date. You will both need to physically visit the courthouse with your driver’s license, ID card, or passport. If either party has had a previous marriage, you must provide the exact date and how it ended. Please bring cash (exact change) or a check for $93.50 to the office located on 500 Whitehead St. in Key West. You will receive the license immediately. If one or both of you are Florida residents, you may obtain the license in advance in the county of which you live. There is a 3 day waiting period before the license is valid. Your ceremony must be performed within 60 days of the effective date.